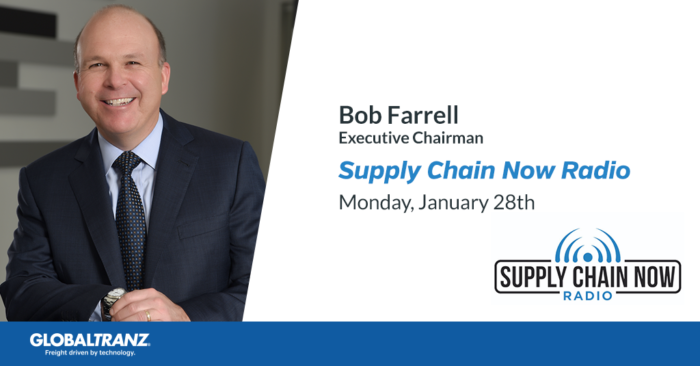 Tune in to Supply Chain Now Radio on Monday, February 28, 2019, to hear GlobalTranz executive chairman Bob Farrell and a distinguished line-up of guests, including U.S. Congressman Drew Ferguson, Steve Banker from ARC Advisory Group, Dr. Manjeet Singh from DHL Supply Chain, discuss the latest trends in supply chain and logistics. Broadcasting live from the SMC3 Jump Start Conference, Supply Chain Now Radio (SCNR) spotlights the best in all things Supply Chain: the people, the technologies, the best practices, and the critical issues of the day. With over 3 million downloads in the last 2 years, Supply Chain Now Radio has become an important source for supply chain and logistics news and information. In addition to his appearance on Supply Chain Radio, Farrell is slated to speak on the panel “E-commerce And The Changing Freight Landscape,” at Jump Start on January 28th. For more details, and to listen to Supply Chain Now Radio, please click here.